Slingboards Lab is not my sole active project. 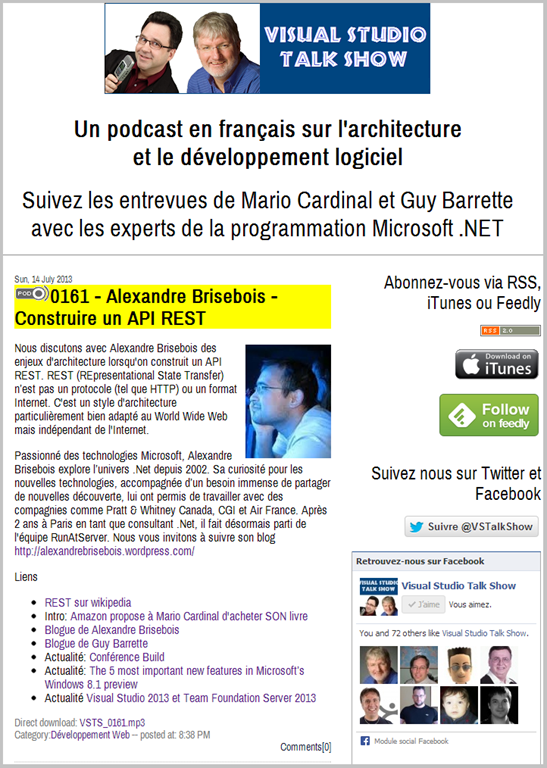 For those of you who speak French, you may know me as the host of the Visual Studio Talk Show, a podcast about software architecture. Each episode is an interview with a software development expert. This month, I am not only publishing episode #177 but I also celebrate the tenth anniversary of this podcast. On November 22nd, 2004, I published the first episode of the Visual Studio Talk Show. Being online for 10 years now, it is probably the oldest French podcast discussing technology. At the time the word podcast was not even part of the standard vocabulary. To explain what a podcast was, I presented it as a radio show on the Internet. The guest for this first episode was Eric Coté . We discussed .NET certification and multilingual website programming. When I launched the podcast, I did not have a co-host so when I recorded the second episode, Eric became co-host. The experience lasted two years before he decided to leave the show. He was then replaced by Guy Barrette which is still the current co-host. Already ten years. Time goes by too quickly. Anyway, this is worth celebrating. I would like to take this opportunity to thank all our listeners across the globe. Through your emails, all over these years, we discovered that we had listeners on every continent. What a nice surprise this was, not to mention your kindness. Thank you! Happy ten years. Let’s hope that we will still be online for the 20th anniversary. Categories: About me, Announcements | Tags: Podcast | Permalink. This summer, I have been invited with Guy Barrette as a guest to Pimp The Cloud podcast. After a brief review of the birth in 2004 of the Visual Studio Talk Show podcast, we discussed the future of Microsoft (Podcast is in French). Categories: Announcements | Tags: Podcast | Permalink. Guy Barrette and I are in the process of migrating our Visual Studio Talk Show podcast to Libsyn, a podcasting hosting service. So far the whole process is going smoothly but migrating 161 shows takes a while!